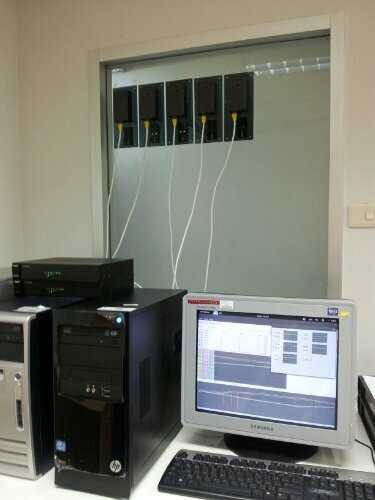 Here is part of my Proview.se installation to log some temperature and humidity values in our factory. We have expanded the number of loggers from 5 to 15 without any problems. It is important to have the sensor far away from the box because the PoE converter is generating some heat. The unit is mounted with the ethernet cable coming from below so that the sensor is the lowest point. The material is acrylic. the box is a standard Arduino box purchased from RS-Components. The communication between the sensor and the Arduino is digital. The reason to why the signals go to the Ax pins is because they are closer to the pins with the power and ground. The Ax pins can be configured either as digital signals as in this case or analog inputs. The “Air-Card” in the USB port of the computer is sending SMS when things goes wrong. I use sms server tools3 for that. Proview is configured to execute a script that creates an sms file for each user. As you can see I am pretty new to writing this code but I have a good solid working knowledge of Modbus RTU and IP protocols. If you have the time please contact me! Thank you for your time! Sorry for my late reply… Did you solve the problem?